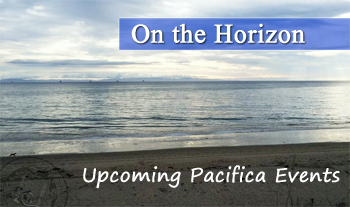 We have a lot of exciting upcoming events taking place at Pacifica. We hope you will join us in celebrating some great student and alumni achievements, as well as experiencing the academic excellence taking place at Pacifica. On Tuesday, December 16th from 6:30-8:30 students in the Community Psychology, Liberation Psychology, and Ecopsychology specialization of the Depth Psychology program will be presenting their poster and multi-media presentations of their fieldwork. The night will showcase and celebrate some of the amazing communities and organizations our students are working with to heal, educate, and liberate. The evening is open to the wider Pacifica community. 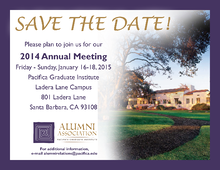 Friday, January 16 kicks-off the Alumni Association's Annual Meeting with a writer's boot camp and alumni authors book faire. "This year’s event aims not only to build community but to share the wealth of talent found amongst our alumni. We hope you will join us for this momentous celebration!" January 21-24 is the first weekend intensive for the Dream Tending 2015 Certificate Program. 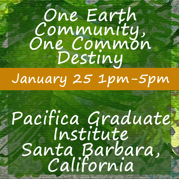 The 2015 Dream Tending Certificate Program is a limited-enrollment intensive that will take place over four, four-day sessions at Pacifica Graduate Institute’s Ladera Lane Campus in Santa Barbara. Participants must have previous Dream Tending experience. Those who successfully complete the program and review process will become Certified Practitioners of Dream Tending, and will be authorized to promote the certification and utilize Dream Tending in their respective practices. The intensive will reflect the multiple dimensions of psychic life and the dream, exploring dream theory and methodology through academic and experiential avenues. Much of the learning will also take place in the dimension of dream life that is sensitive to aesthetic perceiving, poetic imagining, shamanic intuiting, and the art of not-knowing. For more information visit Dream Tending 2015 Certificate Program. The Ecopsychology Network of Southern California and the Community Psychology, Liberation Psychology, Ecopsychology Program (CLE) at Pacifica Graduate Institute warmly invite you to an inspiring Sunday afternoon on the Earth Charter, featuring Mirian Vilela, executive director of Earth Charter International in Costa Rica, and joined by Pacifica faculty Linda Buzzell, Mary Watkins, and Ed Casey. There is a $15 registration fee. You may register for the January 25 event here. Up Against the Wall: Re-Imagining the U.S. -Mexico Border, Ed Casey and Mary Watkins. The Red Place: Transforming Past Traumas Through Relationships, Cynthia Hale. The book signing will take place at Pacifica's Ladera Lane campus at 801 Ladera Lane, Santa Barbara, California, 93108. For more information email Pacifica's bookstore at bookstore@pacifica.edu. Beginning on January 29- February 4 Dr. Susan Rowland will be presenting Shakespeare in Depth: A Four-Week Online and Weekend Workshop. This is a unique opportunity to explore Shakespeare in the context of depth psychology, archetype, myth, and self-exploration. Susan Rowland, a member of Pacifica’s core faculty, will guide a small group of online learners through a week-by-week syllabus that includes downloadable lectures, photographs, readings, key websites, and small discussion groups. All lectures and discussions will be taught and facilitated by Professor Rowland, who has published widely on depth psychology and the arts, including works on Shakespeare and archetypes. Four plays will be studied in relation to dreams, explorations of the psyche, magic, and self-transformation through the use of guided reading, active imagination, creative writing, cultural context, and experimental performance in Pacifica’s beautiful gardens. No prior study of Shakespeare or performance experience is necessary. Everything will be gentle and hospitable to the delicate spirit of the imagination. 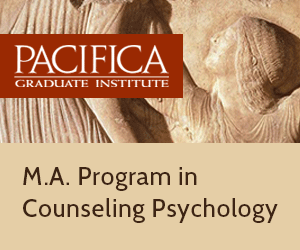 The Pacifica Experience: A One-Day Introduction to Pacifica's Degree Programs, has been designed to give prospective graduate students a comprehensive introduction and orientation to the unique educational features of the school. The program, which begins at 8:30 am and ends at 6:00 pm., takes place multiple times throughout the year and registration is required. The next Pacifica Experience takes place on Saturday, February 7, 2015 at Pacifica's Ladera Lane Campus. The registration fee for of $35 for The Pacifica Experience includes breakfast, lunch, and a $10 gift certificate to the Pacifica Bookstore. For more information and to register visit The Pacifica Experience.